Vietnamese nationals living abroad do their best to observe the Lunar New Year festival, or Tet, as a way to preserve family and traditional values, despite the challenges of replicating old customs in new countries. Traditional dishes and activities associated with Tet, Vietnam’s biggest holiday, are a staple of an overseas Lunar New Year celebration. Dang Phi Nhat Hao, 36, and her family have been living in the U.S. for the past ten years, but that has not stopped them from maintaining their family’s Tet traditions. Living amongst California’s enormous Vietnamese population makes celebrating Tet much more festive than it might be in other states, Hao told Tuoi Tre News. Hao explained that she always celebrates Tet with traditional dishes usually seen in Vietnam, including banh chung (glutinous rice cakes), spring rolls, and traditional sweets, hoping that these foods will help her children form a link to Vietnam. Her family also sets up an offering tray consisting of different fruits to pray to their ancestry, decorates their home, and buys apricot blossoms or peach blossoms to provide their house with a “Tet feel," reminiscent of how it would have been in Vietnam, she shared. Hao also orders ao dai, Vietnam’s traditional dress, from Vietnam and has them shipped to the States for her daughters, aged five and seven. Visiting the relatives is another important part of Tet, and Hao’s family makes sure to see family despite having only a few days off work. Thousands of miles away, in Kiev, Ukraine, 46-year-old Vietnamese Le Thi Hong Thuy has spent the last ten years making banh chung, a must-have dish for a traditional Tet celebration, from scratch. Thuy, along with her Vietnamese neighbors, orders the necessary ingredients to make delicious banh chung so that the Vietnamese community in Kiev can make the dish together, she told Tuoi Tre News. There are around 1,000 Vietnamese living across the Ukrainian capital. Banh chung is wrapped with a special kind of leaf called dong in Vietnamese. “Dong leaves are very precious to us when we make banh chung abroad,” Thuy said. While it takes four dong leaves to make a banh chung, Thuy and her neighbors ‘invented’ a special bamboo frame so that it is only necessary to use two to three leaves per banh chung. Beside visiting friends, the Vietnamese community in Kiev also gives children envelopes with lucky money, a tradition widely observed during the holiday in their native country. For Thuy, observing Tet away from Vietnam is just one of the ways she makes her children aware of the Vietnamese traditions. “I put an emphasis on having my children spend a lot of time with other Vietnamese kids of their age and travel to Vietnam,” Thuy said. But Thuy also wants her international friends to know about Vietnam’s Tet. Every year, Thuy holds a year-end celebration on the last day of the lunar year and invites some of her foreign friends over to celebrate with her family, so they can learn about traditional Vietnamese dishes and have a better understanding of her country’s culture. 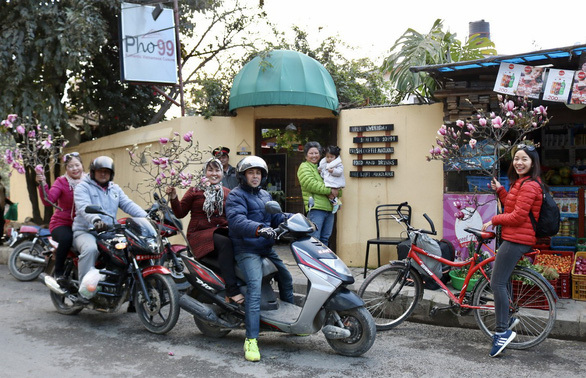 “Most of my foreign friends enjoy fried spring rolls, fried shrimp, and stir-fried dishes,” Thuy said. In the meantime, Thai Hiep, 34, and Huong Xuan, 30, plan to spend their first Tet away from home in Kathmandu, the capital of Nepal. The couple asked for three days off work to celebrate the traditional holiday with their friends and colleagues. Beside cooking traditional dishes and arranging suitable offerings, the couple plans to replace the symbolic apricot blossoms with another flower that has a similar yellow color, and has asked their neighbors for a branch of peach blossoms. 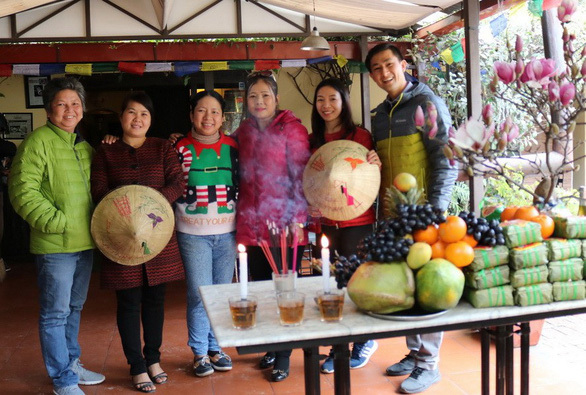 “At the office, our colleagues occasionally introduce Nepalese culture to us and they are very curious about the Vietnamese Tet celebration,” Xuan said, adding that she was excited to invite her colleagues to join her for the holiday. Quyen Vo, 36, is spending her second Tet holiday abroad, this time in Oberlungwitz, Germany. “This year, my husband is going to be away for a business trip during Tet so I am not going to have a big celebration,” Quyen told Tuoi Tre News, adding that the most important part of the celebration for her is family, who she is dearly missing. Hence, she has already bought a lot of tasty sweets in advance of Tet to send to her family back home, while not forgetting to send lucky money to her parents, another symbolic tradition of the holiday. Khanh Dang, a Vietnamese student in Melbourne, Australia, agrees with Quyen’s point of view that family is the most important part of Tet, as she greatly misses her own family. “Living away from home helps me realize family values and how important everyone is to me,” Khanh said. Excited to see banh chung My mother is Vietnamese and my father is Taiwanese. I grew up in Taipei and most of my Lunar New Year celebrations were done in Taiwan. Since I was a child, banh chung has meant New Year and a new start for me, so it is impossible not to be excited every time mom brought some home. For a long time I had not known what Vietnam's Lunar New Year celebration - Tet - is like until recently when I experienced it in Vietnam myself. I realized how familiar Tet is to me. What I like the most, besides the traditional cuisine, is the habit of visiting temples and pagodas on Lunar New Year’s Eve.